Our meeting for biblical studies in Sudbury, Canada got off to a good start last night. We are dealing with the theme, “Challenges Faced by the Early Church,” and making application to the church of the 21st century. 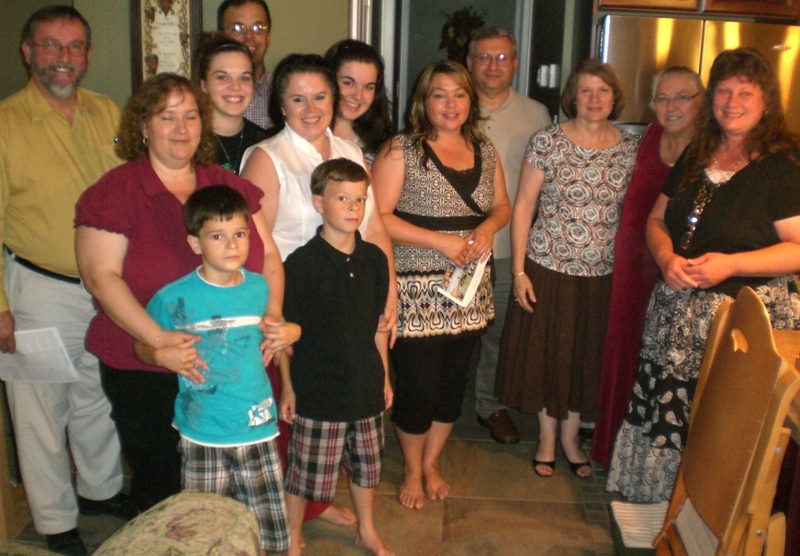 After last night’s meeting we gathered at the home of Denis and Danny Veilleux. Sudbury, Canada. Gathering at home after meeting. Photo by Leon Mauldin. I consider every such teaching opportunity to be a genuine privilege. There is much evidence that the Imperial Cult of Caesar Worship was thriving by the end of the 1st century and in the years following. This was the case with many of the cities mentioned in Rev. 2-3, cities where the Seven Churches of Asia were located. (By churches we do not mean church buildings, but seven congregations of Christians in the Roman province of Asia). Priest of Imperial Cult. Izmir Museum (Smyrna). Photo by Leon Mauldin. Emperor worship had begun as spontaneous demonstration of gratitude to Rome; but toward the end of the first century, in the days of Domitian, the final step was taken and Caesar worship became compulsory. Once a year the Roman citizen must burn a pinch of incense on the altar to the godhead of Caesar; and having done so, he was given a certificate to guarantee that he had performed his religious duty” (Barclay.29). For the Christian, there was (is) but one Lord, and that is Jesus Christ. But there was tremendous pressure to say that Caesar was Lord, and there were many consequences if one failed to do so. On a personal note: I enjoyed teaching at Sewell Hall’s Young Men’s Leadership Camp Mon-Wed, surveying the Seven Churches (Rev. 2-3) and making use of lots of photos of the biblical sites. Tonight my wife and I are in Toronto en route to Sudbury to do a series of Bible lessons there. In the letter to the church at Smyrna, a church which only received commendation from the Lord, Jesus said, “Be faithful until death, and I will give you the crown of life” (Rev. 2:10, NKJV). denotes (a) “the victor’s crown,” the symbol of triumph in the games or some such contest; hence, by metonymy, a reward or prize; (b) “a token of public honor” for distinguished service, military prowess, etc., or of nuptial joy, or festal gladness, especially at the parousia of kings. It was woven as a garland of oak, ivy, parsley, myrtle, or olive, or in imitation of these in gold. In some passages the reference to the games is clear, 1 Cor. 9:25; 2 Tim. 4:8 (“crown of righteousness”); it may be so in 1 Pet. 5:4, where the fadeless character of “the crown of glory” is set in contrast to the garlands of earth. In other passages it stands as an emblem of life, joy, reward and glory, Phil. 4:1; 1 Thess. 2:19; Jas. 1:12 (“crown of life “); Rev. 2:10 (ditto); 3:11; 4:4, 10: of triumph, 6:2; 9:7; 12:1; 14:14. Greek athlete wearing the victor's wreath. Photo by Leon Mauldin. 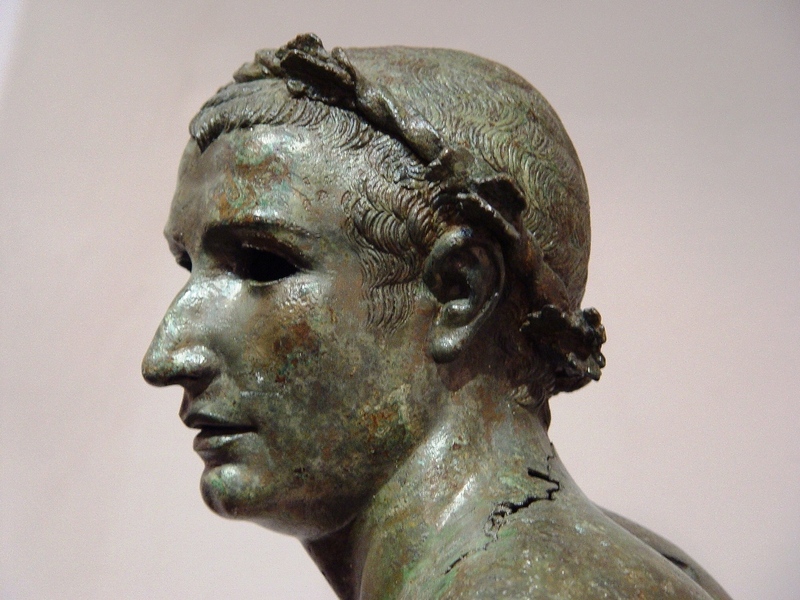 Our photo features a close up of the head of a running athlete and dates back to the late Hellenistic period. 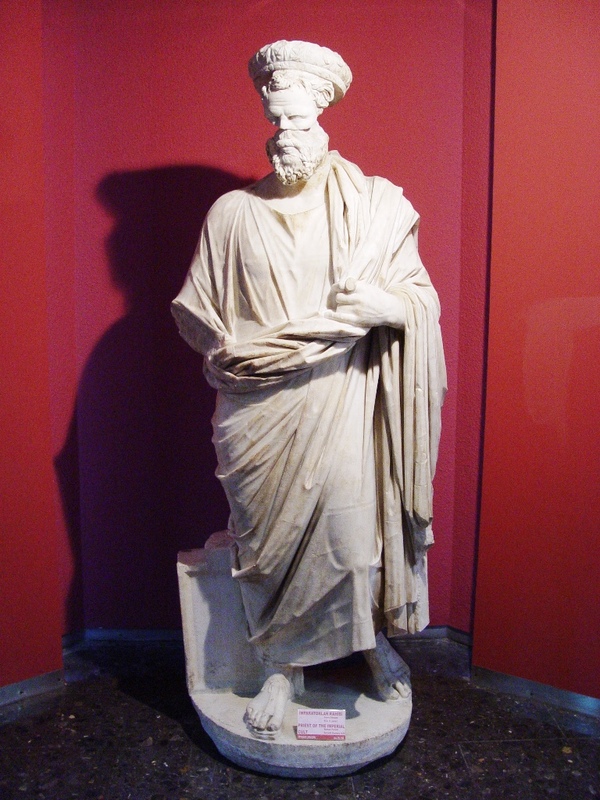 This statue was retrieved from the Agean Sea off the coast of Kyme, and is displayed at the Izmir Museum (biblical Smyrna). Sometimes the question is raised as to whether Jesus meant to be faithful as long as you live or to be faithful to the point of death. The answer is, “Yes.” Yes to both. The Jaffa Gate is located on the western side of Jerusalem, thusly named because of its leading out to Joppa to the west. Jaffa Gate, located on Jerusalem's Western Wall. Photo by Leon Mauldin. This gate is the principal entrance to the Old City. Its name in Arabic is Bab-el-Khalil, the gate of Hebron, as the main road to Hebron started here. It was also called Jaffa Gate because the road to the port city of Jaffa (Joppa) – the coast also started from it. This gate is the only one on the western side of the Old City. A low part of the city wall was torn down and the Crusader moat of the Citadel filled in 1898 for the visit of the German Kaiser Wilhelm II. This gate was also the famous scene of the English General Allenby’s entrance in 1917. You can see some of our previous posts for a map showing Jerusalem’s gates to help with orientation. Today’s featured photo takes us behind Jerusalem’s Golden Gate. Behind Jerusalem's Golden Gate. Photo by Leon Mauldin. You will remember that the Golden Gate is on the eastern wall. Our photo give you a perspective from atop the temple mount viewing the west side of the Golden Gate area. Currently this is the location of a Muslim girl’s school. And a man lame from birth was being carried up, who was placed at the temple gate called “the Beautiful Gate” every day so he could beg for money from those going into the temple courts (NET Bible). On a personal note, this week I am privileged to be part of Gary Fisher’s Indiana Bible Camp, http://indianabiblecamp.com/ Students range from age 13 to 19. I’m teaching a Visualized Survey of the Bible, its history and geography, from Genesis to Revelation, making use of photos of Bible places as we narrate the text. Below is a photo from tonight’s assembly, with Jon Babcock speaking. Shakamak Camp near Jasonville, IN. 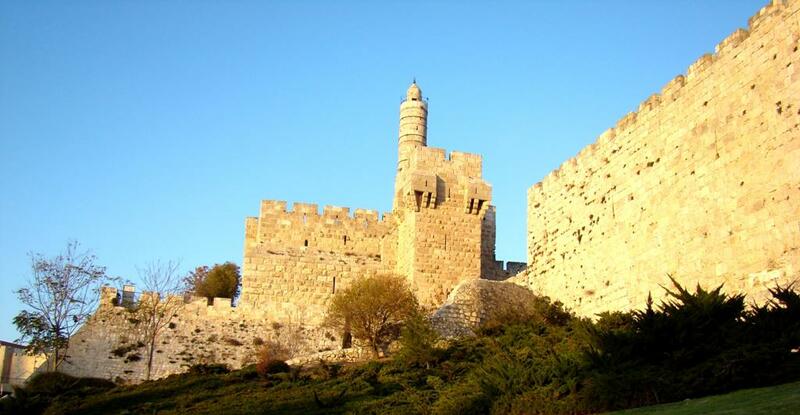 The Citadel of David is located near the Jaffa Gate on Jerusalem’s western wall. Citadel of David, located at Jerusalem's Western Wall near Jaffa Gate. Photo by Leon Mauldin. The citadel of Jerusalem, known as the “Tower of David,” has been a landmark of the city since ancient times. . .Its location was chosen for topographic reasons – this is the highest point of the southwestern hill of Jerusalem, higher than any other point in the ancient city, including the Temple Mount. 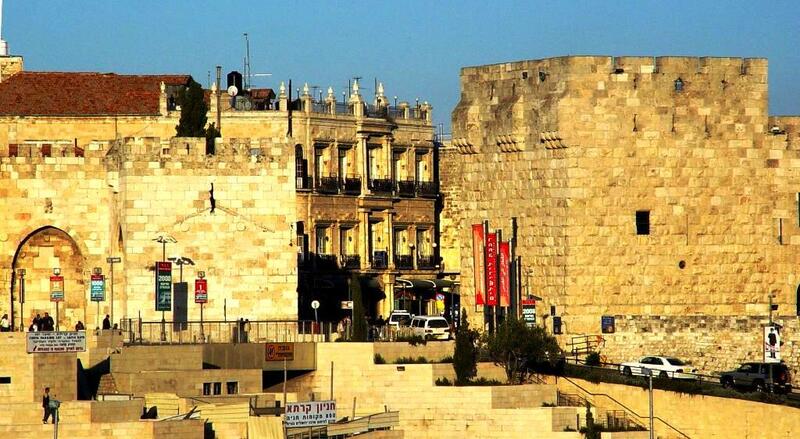 A series of fortifications built here in the course of more than twenty centuries, protected Jerusalem from the west and also overlooked and controlled the entire city. A first archeological survey of the citadel, and excavations, were conducted between 1934 and 1947. Renewed excavations were undertaken after the reunification of the city, between the years 1968 and 1988, preparing the opening of the site to visitors. Every period has left its mark and has been identified in the assemblage of architectural remains. In the citadel’s foundations are buried the remains of Jerusalem’s fortifications from the end of the monarchic period (8th to 6th centuries BCE) through the early Arab period (seventh to eleventh centuries). The outline of the citadel known today is from the Crusader period; the citadel itself was built in the mid-16th century by the Ottoman sultan Suleiman the Magnificent, and incorporates the remains of earlier citadels dating from Ayyubid and Mamluk times. The Citadel is protected by a high wall and large towers, and it is surrounded by a wide, deep moat, part of which was blocked in modern times. The entrance is from the east, via an outer gate, a bridge over the moat and a fortified inner gate house. 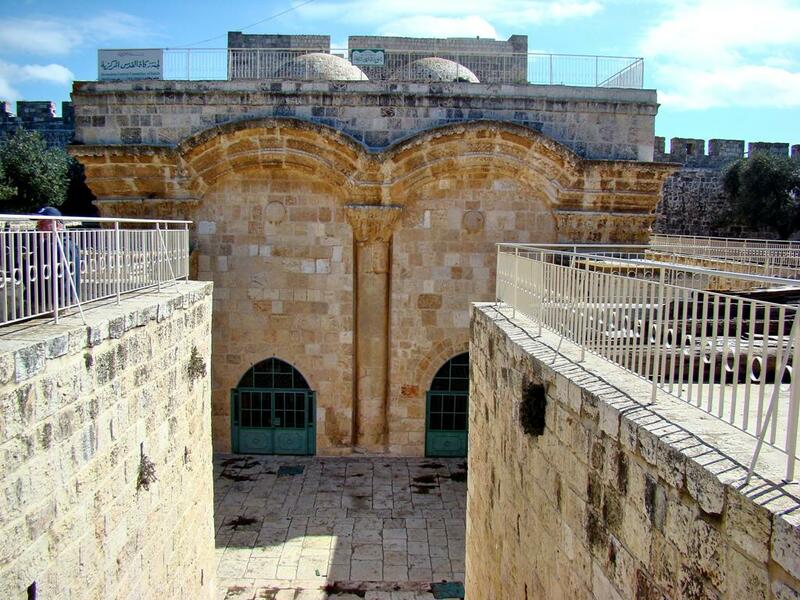 There was a pair of gates located on the south side of the temple mount, known as the Huldah gates. The gate to the west was a double arched gate; the one to the east was triple-arched. The double-arch gate is mostly hidden by a medieval structure. Traces of the eastern gate are still visible. The gates were previously adorned with grand decorated capitols. 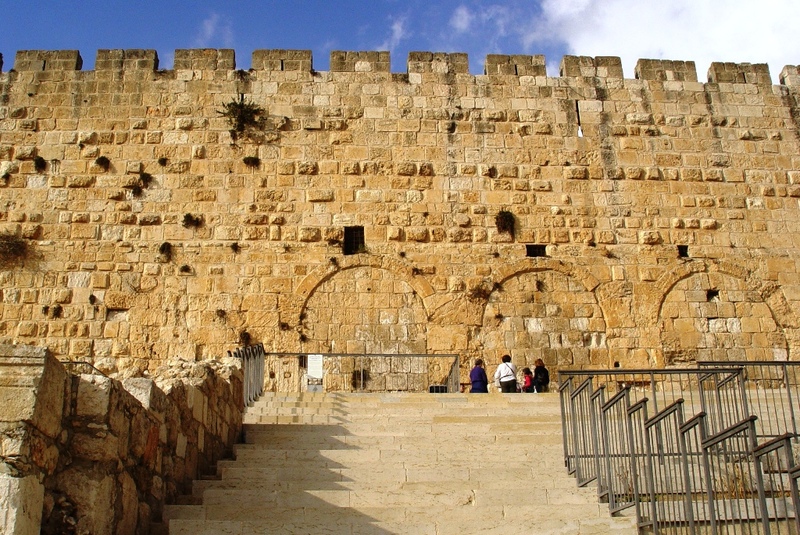 Triple-arched Huldah Gate at southern wall of temple mount. Photo ©Leon Mauldin. Each of the two gates served as a passage way to the temple, entering from the south. The Huldah gates were excavated in the ’70s by Meir Ben-Dov among other Israeli archaeologists. This area is currently a portion of the Southern Wall Archaeological Park. In our photo above you can see how the triple-arched gate has been blocked and assimilated into the wall. The name Huldah comes from the Old Testament prophetess, who lived during the days of Judah’s good king Josiah, when the lost book of the law of the LORD was found: “So Hilkiah the priest, Ahikam, Acbor, Shaphan, and Asaiah went to Huldah the prophetess, the wife of Shullam son of Tikvah, the son of Harhas, the supervisor of the wardrobe. (She lived in Jerusalem in the Second District)” (2 Kings 22:14, NET). You are currently browsing the Leon's Message Board blog archives for July, 2011.